As the plot thickens in the San Bernardino massacre, the FBI is trying to decipher several issues from abuse of the marriage to the immigration system and whether these terrorists had Jihadi brides. Also, who are these Russian girls involved in the marriage scheme? The FBI also believes that Farook had ties to a group of jihadists in California who were arrested in 2012 (which caused a previous attack to be thwarted that Farook was planning) for attempting to travel to Afghanistan to join al Qaeda. Then we have the possible main ringleader, second man Mohamed Abdullahi Hassan (aka Miski, Malik John, Abdul Malik Jones, Abdimalik Jones), who is a Somalian-born permanent resident from Minnesota who was in contact with San Bernardino shooters Syed Farook and Tashfeen Malik over social media. In addition, as Shoebat.com reported, an “attack in Garland Texas was carried out by ISIS lone wolves” with one named “Elton Simpson,” reportedly one of the two gunmen responsible for the shooting in Garland, Texas, was indeed a homegrown ISIS lone wolf and a convert to Islam, who, in 2010, had links to Hassan. And then we have four men who were arrested in the 2012 case, Sohiel Kabir. Kabir, who was convicted and sentenced to 25 years in prison, was the recruiter who helped radicalize others, and Farook was in the social circle of Kabir, which explains why, in 2012, Farook and friends abandoned a plan to carry out a massacre. Besides Syed Farook, we have his brother, Raheel Farook, the man who was being taunted as a patriotic American, Navy veteran, serving from 2003 to 2007 and earning the Expeditionary Medal and the Global War on Terrorism Service Medal, among other awards. As it turns out, all the hoopla meant little. The National Defense Service Medal is awarded when you sign on the dotted line, enlisting in a time of war. But everyone who signed got it for simply showing up. He was not “decorated,” as many say. He married Tatiana Chernykh (aka Tatiana Gigliotti) in 2011, only to have a reported domestic disturbance and police-conducted follow-up interviews, and the Riverside County District Attorney’s office filed charges for domestic battery. Then this ‘supposed hero’ involvement created further questions regarding his involvement with a Green-Card scam. In Muslim terrorism operations, there are two elements necessary. The first is the die-hard Muslim fanatic who can dodge every attempt to reveal his cover, and the second is the local town liberal idiot who can easily be converted to whatever he is told about how great Islam is. We have the unresolved question on how Tatiana’s sister, Mariya Chernykh, was introduced to Enrique Marquez, the mule, Syed Farook’s neighbor, and a Mexican-American convert to Islam who was used to do two things: to purchase the guns under his name to be used by Farook and his wife, Tashfeen Malik, in their shooting spree, and to marry Raheel’s sister-in-law, Tatiana’s sister, Mariya Chernykh, 25, to help give her the green card. Mariya entered from Voronezh Oblast, Russia, to the United States in 2009. The last name Chernykh from Voronezh is usually Subbotnik Jews or a spin-off from Ottoman Empire, Muslim Tatars in Crimea, which has many links to Muslim community of Tatars in Crimea, Kiev, Ukraine, and Tatarstan in Russia. Is this another Jihadi-bride plot? Only time will tell. The whole mess reveals more troubling issues than terrorism. It shows the vulnerability of the immigration system, the ability for ISIS to recruit Americans through Da’wa and the untrustworthy Muslim community who instead of coming forth, would collectively deny and hide, even use the tragedy to attack and promote that Americans are infected with Islamophobia. In 2008, as Farook was becoming more devoted to his Muslim faith, Marquez converted to Islam and began attending Friday prayers at a Corona mosque. Marquez never seemed terribly pious, according to Azmi Hasan, manager at the Islamic Society of Corona-Norco. But the mosque also calls to end tax money to Israel, tells how to raise the generation of Saladin (Jihad), and raises awareness of the plight of Muslims in Syria. While the Jihadi titles were obvious, the access was not allowed. The Islamists are aware that folks like us are on their tail. To see the center below, it would make an American apple-pie wonder–this is not Saudi Arabia, Qatar, or Bahrain. No, its Corona, California, so why did these Muslims never assimilate? So much for such testimony from CAIR and the Muslim community, especially since Marquez confessed to federal investigators that he and Farook had planned an attack (possibly the school) of their own in 2012, but abandoned it. Raheel Farook and his wife, Tatiana, were witnesses at Marquez’s nuptials with Mariya Chernykh, Tatiana’s sister, according to Riverside County records. The ceremony took place at the Islamic Society of Corona-Norco, according to the marriage license; yet the mosque’s facility manager covered that up and denied that it had occurred there. Azmi Hasan said that he understood Marquez had converted to Islam, but said he was not a member of that mosque. It is now obvious that Azmi Hasan should stand in line with millions of Muruna-inspired Muslim liars. I could imagine if Trump dare suggest profiling. It matters nothing to this system how many people die, and, as I argued, this will never be resolved until the U.S. deals with a massive death toll. While profiling (so they argue) is not 100% fool-proof, it is at least 80-90% successful, and yes, shootings are common in the U.S., but why do Americans insist on importing additional shootings? Even from among the so-called conservatives, Bill O’Reilly argues with Trump that we need Muslims to combat ISIS. No, we don’t, Mr. O’Reilly. You’re a loon. I sat and spoke with Woolsey in the past and found the man to be very stupid: he knew nothing on how the Middle East functions. “Libya,” “Iraq,” and “Egypt” ended up with his policy “to make them nervous,” and the result was ISIS. Sitting in the back is Frank Gaffney, another conservative-idiot from the Center For Security Policy, whom I also knew. As I always say, the West only learns in two ways: stop being polite and politically correct (become like me, crude and un-polite), or be politically correct and learn through high-death toll. Anyone else with a better suggestion, have at it. In order to catch the terrorists, an FBI agent has to know Islam; they must know how to conduct such discussion in Arabic and know about various religious edicts to terrorist incidents and to specific battles in order to infiltrate. Theodore John “Ted” Kaczynski, also known as the “Unabomber,” was not caught for two years. With the ISIS lone-wolf program, we are talking about tracking tens of thousands of unabombers or unabomber wannabes. 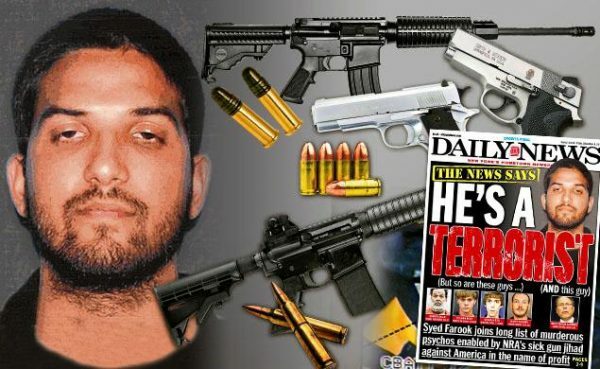 Keep in mind, Farook was a bomb maker. These days, pre-emptive strikes carried out by the security apparatus are useless in preventing thousands of Muslim unabombers, who “go dark” and use encrypted chatting platforms where intelligence agencies trying to track their communications with 16,000 members and who are growing in numbers by the thousands every day. We have explained before these revelations, even before the FBIs discovery into Farook’s mission, how this had all the hallmark of an ISIS terror ring and also why it was impossible to detect which will cross the eyes of any seasoned FBI agent. We explained all this to police officials on November 13, just prior to the Paris and San Bernardino massacres to no avail, as you can see. The District Attorney of New Jersey cancelled all training by “Islamophobes” like myself, out of pressure from CAIR.